Friday, May 5th was a monumental day for my family. My cousin, Libni Banya Cortez, 25, graduated with a Master’s degree in Clinical Psychology from Vanguard University, making her the first in our family to achieve this level of education. The last few Sundays leading up to this milestone, my abuelita, tías, and mamá spent hours in conversation, deciding how we were going to celebrate such an event (by the way, they decided on tacos, aguas frescas, pastel, and naturally, a piñata). Libni—aided by my sister and I via iMessage—went on a hunt for the dress she would forever remember as her graduation dress and, perhaps more importantly, for the perfect pair of heels in which she would walk across that long-awaited stage. 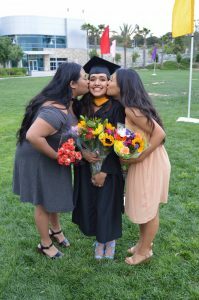 My mamá purchased round-trip airplane tickets to fly my sister in from UC Davis and phoned me numerous times to ask what day and time I would return home and if I had bought a new dress yet. I felt the extent of their celebratory preparations—and what it meant to all of them to be making such preparations—from UCLA, where I am roughly fifty miles away from Libni and my family. However, years before the rest of us could negotiate on food and company and outfits and songs, there was a more imperative decision that had to be made and preparatory measures that had to be taken: Libni had to decide she was going to enroll in and complete graduate school. That decision alone took three years to realize. 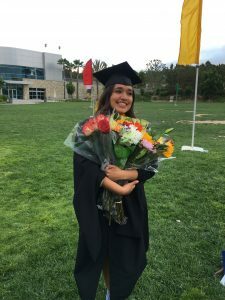 As a first-generation Mexican-American aspiring to earn her Master’s degree, Libni pursued a diploma only six percent of Mexican-Americans in the United States are successful in obtaining. When asked about the challenges of graduate school, Libni answers that her university and field of study are both predominantly Anglo, which was in itself a navigational complication. In spite of this, she adds, her greatest difficulty was actually getting to graduate school. 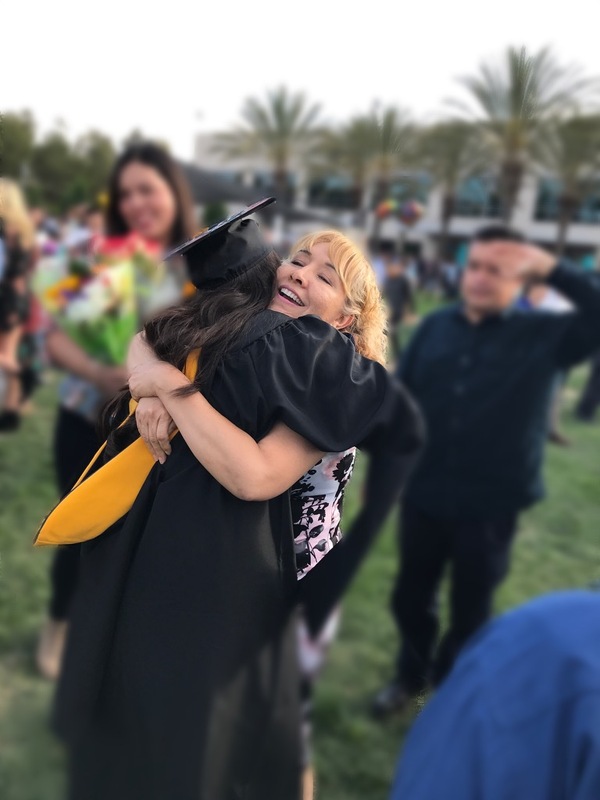 Despite all the obstacles that preceded and followed her admission into Vanguard University, Libni’s personal and academic resilience reaped a newfound source of pride in our family. In our lifetimes, we will experience moments that will forever change the narrative of the generations to follow. In one of their own moments, our mamás crossed the border through the desert together. As I witness my cousin cross that stage toward her Master’s hood and diploma, in light blue heels and a unique cap that reads “Sanar y Amar,” I realize Libni is living a moment of her own. I imagine the borders—I mean barriers—she is shattering. They are called limitations, ignorance, mental illness, statistics, and stigmas. She is a brown revolution and I fathom this is what promise looks like. As I watch my family gather around tables full of tacos and rizas, I realize this is the first of infinite graduate celebrations I will get to attend for my own flesh and blood. These celebrations will continue long after we are gone because Libni has paved a way for our family where there was not one before. Libni, thank you for sharing your éxito with us. Our narratives are forever changed because of it. Wherever you may take this degree, I know it will be blessed for this is your calling and you have prepared well for it. Felicidades, prima. Note from Libni: I would like to tell other students of color something I wish I carried going into graduate school. Do not feel insecure about the way you look or speak. We are often put down for our cultures so we grow a sense of shame in our skin, accents, and the communities we come from. Know that we can do things just as well as others, if not better, even with less opportunities and resources because we know both worlds. I am proud to be Mexican and speak Spanish; I can reach twice the amount of people because of it. I want everyone to be empowered because confidence in yourself can open doors for you and take you places you cannot imagine.